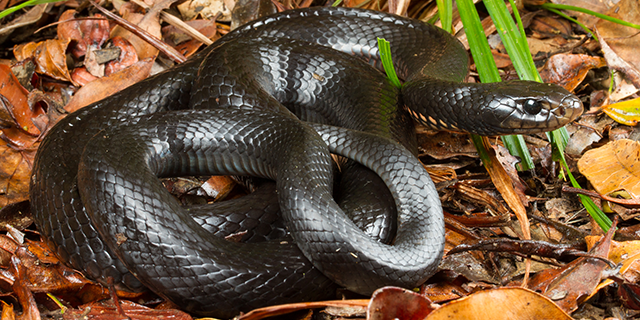 Although their bites are rarely life-threatening, black snakes (genus Pseudechis), such as this red-bellied black snake (Pseudechis porphyriacus) are responsible for a number of hospitalisations every year. The Australian Venomous Injury Project (AVIP) has been the cornerstone of AVRU’s national data collection and analysis programme since AVRU was founded in 1994. AVIP provides a national snapshot of all types of venom-related injuries, from ants, bees, wasps and spiders through to venomous snakes, freshwater and marine fish and jellyfish. In 2013, Dr Ronelle Welton began rejuvenating AVIP and developed new national databases that for the first time brought together public hospital admission records, cause of death unit record files and coronial datasets. These data were then integrated into a geospatial analysis system (based on the ArcGIS platform) and combined with data from other sources to assess the overlap of envenoming events with remoteness structures, socioeconomic regions, primary health networks, road accessibility, hospital locations, urban centres and indigenous lands. The first national study of the bites and stings inflicted by Australia’s venomous creatures shows that our towns and cities are hotspots for deadly encounters. Data collected over 13 years (2000-2013) revealed that there were over 41,000 admissions to Australian hospitals arising from contact with venomous animals and insects. These findings were published in the Royal Australian College of Physicians’ Internal Medicine Journal. Bees and wasps accounted for the highest number of hospital admissions. 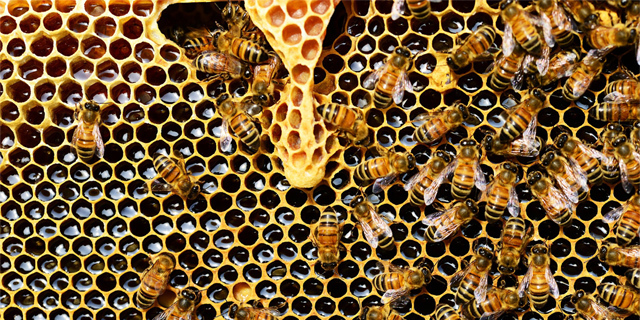 Bees and other insects – not snakes, spiders, or jellyfish –were found to pose the biggest threat to public health, with over 76% of hospital admissions resulting from contact with these venomous arthropods. Of these, bees and wasps accounted for approximately one-third (31%) of hospital admissions, spider bites (30%), ticks and ants (11%), while scorpions, centipedes and millipedes accounted for less than 1%. Snake bites accounted for more than 15% of the admissions recorded. During the study period, 64 people were recorded as being killed by a venomous bite or sting. Over half of these deaths (34) were the result of anaphylaxis following an insect bite or sting. Snakes were the country’s deadliest venomous creature, accounting for 27 deaths during this period. Snake bite envenoming caused almost twice as many deaths per hospital admission than any other venomous creature. However, to put that in perspective, over 125,000 people die from snake bite globally each year. Surprisingly, over half of these deaths happened at home, and almost two-thirds (64%) occurred in major cities and inner-regional areas where healthcare is readily accessible. 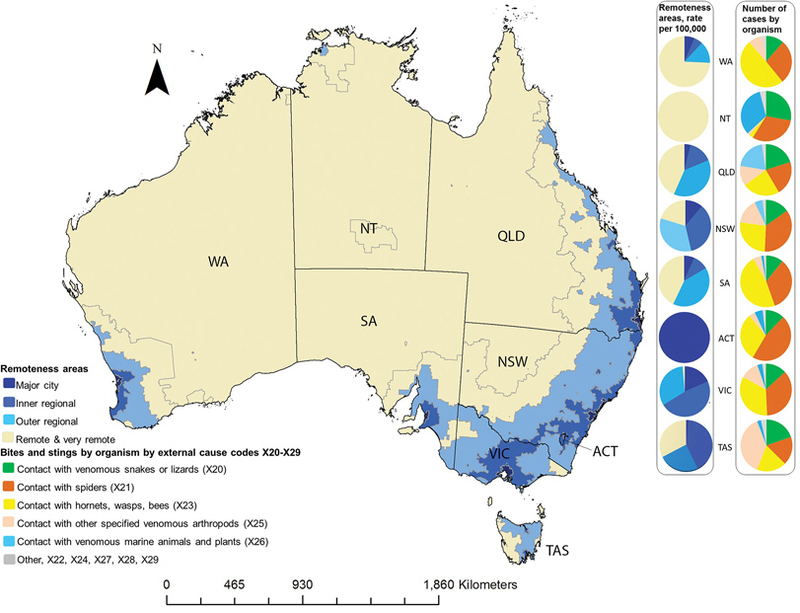 Map of Australia by remoteness area and bite and sting hospitalisations by remoteness area and organism: Australia, August 2000–May 2013. Source: Internal Medicine Journal. Men aged 30 to 35-years-old were most likely to be bitten or stung according, followed closely by the five to nine-year-old age group. Regardless of age, however, men were far more likely to be admitted for enevenoming than their female counterparts. From 0-4 years through to 75 and older, there was a large discrepancy between men and women in the data. The study was limited to deaths that were recorded as being caused by envenoming meaning that the information reviewed was only as accurate as the information entered. As a result, some records may not have made it into the national dataset. However, according to the data there were only three recorded marine stinger fatalities in the study, all of them box jellyfish. This is perhaps a testament to the effectiveness of the public safety messaging regarding these jellyfish. 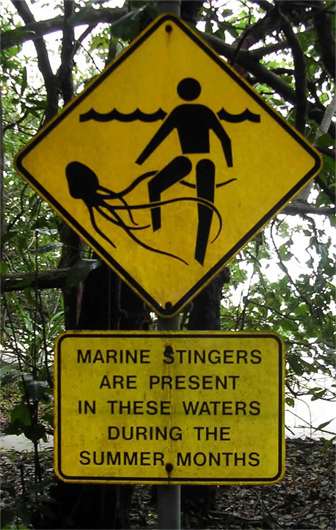 Marine stinger sign warning of the presence of Box Jellyfish in at a Queensland beach. Image: TydeNet. Studies conducted as part of the AVIP continue to inform researchers and clinicians alike about the health burden of venomous creatures in Australia and the Oceanic Region. This data will ensure that future guidelines for the prevention and management of venomous injuries are informed by accurate local datasets. For example, in South Australia, there are more stings and anaphylaxis from bees, in Queensland the major issue is snake bites, and in Tasmania, their biggest issue is jumper ant anaphylaxis. By continuing to collect regional data the research of the AVRU will be able to inform future guidelines for every Australian State and Territory. Sections of this document were first published in the Pursuit article "Venomous stings and bites lie close to home"